My son will be home with me tomorrow—Veterans Day. Thanks to war veterans old and new for their service. I wish you all peace. • 17A. [User of barley malt] is a BEER BREWER. One W, two Bs, three Rs, four Es. • 30A. [Emphatic boast of responsibility] clues I DID INDEED. I dunno, feels more like a boast of accomplishment than responsibility. • 46A. [One way to be armed] is TO THE TEETH. • 64A. This jingle/slogan meant nothing to me, but the crossings told me ROTO-ROOTER is the ["And away go troubles..." company]. • 15A. [McGwire's friendly home-run rival] is Sammy SOSA. Have you seen the latest pictures in which his "rejuvenated" skin looks freakishly pale? • 19A. [Stick in the mud] is the verb MIRE. • 37A. A street GANG is a [Turf group]. • 38A. [Slo-___ fuse] clues BLO. I can think only of Rainblo gumballs. • 51A. Never heard of this ORB, the [Marvel Comics villain with an eyeball-like helmet]. • 68A. NORMS? [They're par for the course]. • 9D. [Unbending] clues HARD-LINE. 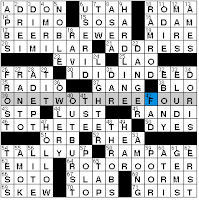 Are you HARD-LINE when it comes to crossword puzzle quality? • 'Tis the season. 26A: ["Punkin" cover] is FROST and 47D: [Like a jack-o'-lantern] is HOLLOW. • 32D. [Key shade] is vowel-consonant-O-consonant-Y. EBONY this time; could be IVORY. • 20A. [2002 #1 hit for rapper Ja Rule] is ALWAYS ON TIME. • 36A. [1989 #1 hit for Paula Abdul] is FOREVER YOUR GIRL. • 56A. [1989 #1 hit for the Bangles] is ETERNAL FLAME. I'd never heard of any of these songs, so I took a gander at them on YouTube. I discovered 20A is laced with profanity and not a very feminist cut at all. 36A was poppy with a too-long instrumental portion near the beginning (dance! keep dancing!) and not my style. The only Bangles song I know is...wait, am I thinking of Katrina & the Waves? "Walk Like an Egyptian" is Bangles, "Walking on Sunshine" is Katrina. Yes? The live performance of 56A I watched on YouTube suggests I like the Bangles OK, but I really do not know their oeuvre. I'm sorry, nobody asked about my musical history. Anyway—I liked a lot of the fill in this puzzle. 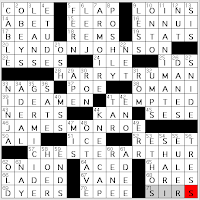 Check out L.A. Crossword Confidential Wednesday morning for more details. 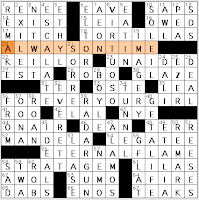 Either this puzzle's a notch or two harder than usual or I'm a notch sleepier. The nuptial theme celebrates Ben's upcoming (this very weekend!) wedding. 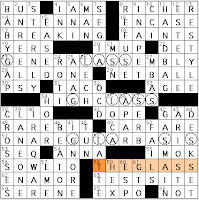 17A/58A BREAKING / THE GLASS is clued as [a Jewish wedding tradition...and the theme of this puzzle]. The three longest answers have a broken GLASS interspersed among their letters. The toughest spots for me were 7D: [Spanish province]/SEGIA (never heard of it) and 29A: [Sport spun off from James Naismith's game]/NETBALL (never heard of it). The dictionary entry tells me netball is a mostly British game with seven-player teams and a requirement to stand still when in possession of the ball. That must be weird for a basketball fan to watch. Also, down at 43D: ["Orlando Furioso" poet] is ARIOSTO. Why did I need all seven crossings? • ESTELLE Getty [was actually a year younger than Bea, despite playing her mother on TV]'s Golden Girls. • [Oft-knocked-off thing] is a HANDBAG. That's "knocked off" in terms of being counterfeited. • [Emulates the chicken] clues CROSSES, as in "Why did the chicken cross the road?" • BABYGAP is a [Clothing store with models who weigh A LOT less than Ralph Lauren's]. Ha! • LOCA is the [Word rhymed with "mocha," in a 1999 Ricky Martin hit]. I may have stopped listening to most pop music a decade before "La Vida Loca," but some songs are simply inescapable. • 20A. [World War II veteran...] LYNDON JOHNSON. Also Ike, JFK, Nixon, Ford, GWH Bush. Carter was still at Annapolis; Reagan served in the military but his eyesight kept him from active duty (and full "veteran" status)... Here's the skinny. • 28A. [World War I veteran...] HARRY TRUMAN (the only U.S. president with that distinction, btw). • 46A. [Revolutionary War veteran...] JAMES MONROE (ditto Andrew Jackson and some guy named George Washington...). There's a bonus with this war and its heroes by way of [American Revolutionary soldier Nathan] HALE, he of "I regret that I have but one life to lose for my country" fame. Do they make 'em like that any more? • 57A. [Civil War veteran...] CHESTER ARTHUR (likewise Andrew Johnson, Ulysses Grant, Rutherford Hayes, James Garfield, Benjamin Harrison and William McKinley). • [It's more in an adage] for LESS, as in architect Mies van der Rohe's minimalist observation: "Less is more." I only wish the long but clinical INANIMATE and GERMICIDE, clued as [Lifeless] and [Disinfectant] respectively could have been given the same clever treatment as these shorter entries; ditto KNEECAP [Triangular leg bone]. Better is ARMOIRE with the visual [Where shirts and ties may be kept] or the active [Dangled a carrot in front of] for TEMPTED. As for not only our leaders, but all of our men and women who have served in the armed forces and seen active duty—our most profound respect and appreciation is yours. And not only on Veterans Day. All right, I gotta feed my kid breakfast and oversee some homework, so let me head straight to the list of favorites. 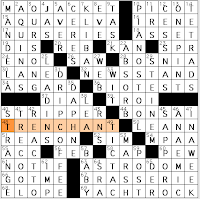 Favorite word: TRENCHANT, or [Sharp-edged]. I need to use this word more often. Favorite clue: [People mover?] for a NEWSSTAND that moves a lot of issues of People. Favorite fill: MAO JACKET atop AQUA VELVA, goofy YACHT ROCK, KLIBAN the ["Cat" cartoonist]. Other clues I liked: [Thelonious Monk supporter] is his PIANO STOOL. Gloria STEINEM is the [Feminist who wrote "Outrageous Acts and Everyday Rebellions]. [Mythical realm on one end of the rainbow bridge Bifrost] is ASGARD; I don't know a ton of Norse mythology but it's so appealing.